While commercial cartridge manufacturers have always done a great job at maintaining the accuracy, safety and power of their loads, additional performance advantages can be recognized in some cases by handloading. This is due to the fact that each gun responds differently to a given load in terms of accuracy and velocity. There are additional concerns about product liability—the manufacturers must meet published pressure standards for every cartridge sold. In many cases the pressure standards can be exceeded without creating undue hazard of damage to the gun or shooter but commercial loaders are likely to not approach this limit. If you like to experiment with different bullets or own a firearm that is chambered for an old or rare cartridge, handloading may be your only option to find ammunition. Reloading your own ammunition also makes shooting cheaper since you remove a lot of the costs of marketing, labor and legal liability that you have to pay when you buy commercial ammunition. While handloading gives you greater independence in obtaining ammunition for your gun, I caution you against accepting the nonsense projected onto some ‘SHTF’ type forums that you will be able to make your ammunition from ‘scratch’ or that you would be able to improvise effectively without use of the actual reloading components. A small arms cartridge consists of primer, cartridge case, propellant and projectile. Bullets can be made out of lead if you have the equipment. This process is good, cheap and reliable because lead can be found almost anywhere (at least until lead is banned by governments acting in accordance with UN Agenda 21.) Modern propellant is carefully refined to work across a limited range of cartridges though many brands are able to function for almost all handguns or for almost all small rifles and so on. But it must be possessed beforehand. Unless you are an experienced chemical engineer with the appropriate tools and materials, I don’t see this as being possible. Cartridge cases are reusable. Sometimes you can reuse them 5-10 times. Collecting and reusing the brass DOES decrease your reliance on ‘the grid’ and should be done whenever possible. The same chemical engineer who successfully made the propellant can approach priming compounds if they have no other choice or have a death wish. Primers are much more sensitive to shock than propellant. This is why they are the first compound in the ‘explosive-propellant train’ that is a small arms cartridge. I’ve been to two primer plants in my life and I couldn’t wait to get as far away as possible from both. Wildcatting is where things get really interesting. Two cartridges that I have promoted through the years as high-performance alternatives to the 380 ACP are the 32 North American Arms and 9mm Police cartridges. 32 NAA is a 380 ACP cartridge case that is necked down to shoot 32-caliber bullets. This increases velocity and feed reliability at the same time. The 9mm Police is 1mm longer than the 380 ACP and loaded to a higher pressure. Both cartridges are commercially available but both are difficult to find. 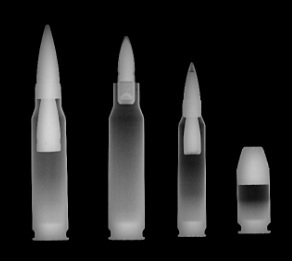 To add trouble on top of trouble, many of the higher performance JHP bullets are not available from the factory because of the limited market that exists today for these rounds. Handloading alleviates a lot of these problems. Remember that market share and name recognition are key to success in most businesses. It would be difficult to convince Company A to load their premium bullet in a small market cartridge that bears the name of Company B. So some things, if you want it badly enough, you have to make it yourself. What follows is a list of odd cartridge and bullet combinations that you might find helpful. As we do business on a ‘piecework’ basis, the list will be growing through time and in a very random fashion with respect to the content that is being added. Please check back frequently and thank you for your support.